For federal agencies seeking to install solar renewable energy or replace aging HVAC equipment, the ESPC ENABLE program now provides a streamlined funding and procurement option. 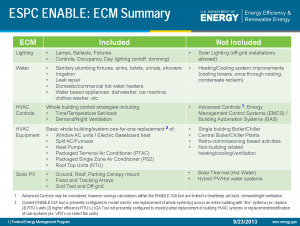 In a move to increase the benefits of the ESPC ENABLE program to federal agencies, the US Department of Energy (DOE) has addressed one of the primary comments to the program: “Give us more!” Previously, the three Energy Conservation Measures (ECMs) allowed under the program were limited to lighting retrofits, simple building controls, and plumbing fixture retro fits. Now, the good folks at DOE’s Federal Energy Management Program (FEMP), who manage ESPC ENABLE, are giving us more options by expanding the ENABLE ECMs to include … drum roll, please … solar photovoltaic (PV) and Heating, Ventilation, and Air Conditioning (HVAC) equipment replacement! Curious what ESPC ENABLE stands for? For a quick primer on the ESPC ENABLE program, check out my previous post, Keeping it Simple with ESPC ENABLE. 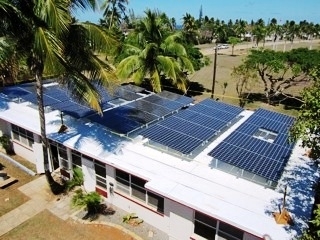 Using the ESPC ENABLE program, federal agencies now have another procurement vehicle at their disposal to fund and install solar PV at their facilities. The solar PV ECM includes mounting scenarios for ground, roof, and parking canopies. In addition, both grid-tied and off-grid systems are allowed (microgrid, anyone? ), but the program excludes solar hot water. Installing renewable energy using ESPC has gained significant traction lately, particularly under the DOE’s flagship ESPC contract. With solar now part of the ENABLE program, federal agencies have another “arrow” in their quiver of available contracting methods to implement renewable energy. Meanwhile, the HVAC equipment replacement ECM includes one-for-one replacement of “simple” HVAC equipment, including direct expansion split systems, packaged units, window units, rooftop units, and heat pumps. Hydronic systems including boilers and chillers remain excluded from the program. By adding HVAC replacement to ENABLE, the ease of implementing (and funding) increasingly popular technology like variable refrigerant flow (VRF) systems will improve dramatically. For those of you in humid or tropical environments, take note! Congressionally-mandated reductions in spending has reduced already scarce capital budgets, so alternative funding methods like ENABLE will continue to become more popular for federal agencies. Further, executive orders (for example, EO 13423) and policy mandates (see Energy Independence & Security Act of 2007) require dramatic energy efficiency improvements and additional renewable generation. The addition of solar and HVAC equipment to ENABLE comes at a very opportune time and makes the program an ala carte funding and contracting method to solve these challenges, using one streamlined acquisition vehicle. It’s been two years since the program was unveiled and DOE has made it clear they’re committed to ENABLE. 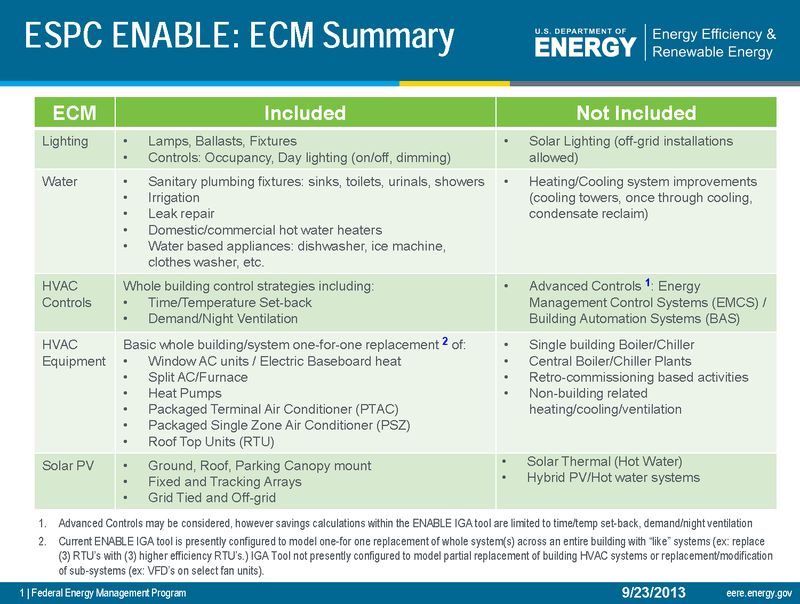 And with the addition of the ECMs for solar and HVAC replacement, ENABLE is more attractive than ever. What are your thoughts on DOE’s expansion of the ESPC ENABLE program? Please comment below!